Ever since the Visitors came twenty years ago the world has stood still, never rotating and never allowing people to see differences in the time of day. It is the only world Megan knows and it contains an area of forsaken wilderness known as The Zone. Everyone is scared of it, and no one dares wander it, no one other than the trackers who built maps within it and the few who dare live in its one horse towns. Megan’s father was one such tracker and even though no one has seen him for two years and presumes he is dead, Megan is determined to enter The Zone and find him. 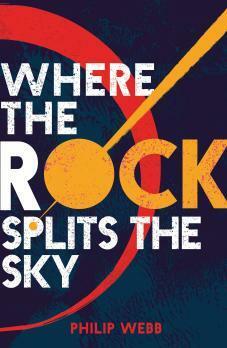 Where the Rock Splits the Sky is one of the most mind boggling books I have read. Its unique storyline sets it apart from so many young adult books out there and it was a promising read. However the way it was written made it difficult to follow and I was left confused by some events throughout. The story was pretty crazy. Set 20 years after an alien invasion in Texas and other western states of the US, in an area where technology no longer worked it felt like a Wild western style dystopian universe interspersed with aliens. It was just hard to get your head around. I really struggled with the setting and the way it was written so the story was kinda overshadowed a lot by that. Once I got my head around enough to understand what was going on it was a lot better and I got into the story more. I enjoyed the journey that Megan took and her friends that she made on the way and thought that friendship was a major part of the book as it helped her understand who she really was. The story was focused on her father but I felt like a lot of it was her own soul searching, not just the searching for him that she was doing. The characters helped me carry on with the book a lot too. Luis and Megan were ok enough but didn’t really click with me. Kelly and Marshall on the other hand really made the book for me and I absolutely loved Kelly’s humour and personality. The pros weighed up the cons of this book and I did enjoy it more than I thought I was going to at first. I think that the ideas portrayed in the book when it came to The Zone didn’t work because of the way they were explained. I just couldn’t follow the writing very well and it kinda ruined the book for me, taking forever to read just 266 pages and making me skim read a lot of it because I just couldn’t follow. Maybe its an issue with me and my imagination but this book wasn’t for me. If you are into aliens and sci-fi with a realistic twist then Where the Rock Splits the Sky will be for you. It is a mind boggling adventure through an area of the US that actually exists but has been changed beyond recognition. It was very nearly a DNF for me but once I got into it I found myself enjoying it. I think most of that was down to the characters and would be shocked if anyone didn’t like Kelly particularly! Its not a book I would thrust into many peoples hands but I definitely would be intrigued to find out what people think. Where the Rock Splits the Sky was published in March by Chicken House Books. My copy was sent from the publisher in exchange for an honest review.